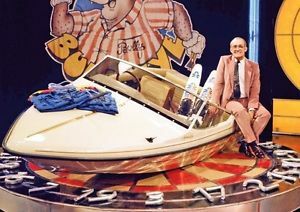 Those of a certain age will remember that 1980s classic game show, Bullseye. With garish sets, darts player of dubious talent (and quizzers of sometimes even more dubious talent), nevertheless the quiz had a charm all of its own - largely down to the delightful northern host, Jim Bowen. With his soft Yorkshire accent and gentle tea-time wisecracks, the show was a surprisingly good watch. Like all great game shows of its time, however, it was also famous for its catchphrases. “EEEEEIIIIINN ONE!” intoned the voice over guy, as the prizes were announced. “Stay out of the black and into the red, you get nothing in this game for two in a bed,” Jim would warn each time, somehow managing to add a surprising amount of gravitas to what is a decidedly cheesy line. But, for many of us, the highlight came at the end. After the winning pair (who we usually not related to each other) would almost invariably choose to go for the gamble for the mystery prize (well, who wouldn’t, when all you’d won up to that point was £127 quid, a bathrobe and a flowery teas-maid). One hundred and one in six darts. Surely achievable? But, often, sadly not, and the couple would have to decide who got custody rights over the fondue set and digital alarm clock. And then, in a classic moment, Jim would always declare to the heartbroken pair, “Let’s have a look at what you could have won!” and out from the back stage minions would come, wheeling the prize the team came oh so close to winning (in my mind, it always would be a speed boat for a team that lived in Birmingham or some such place). Unlike some of the other nocturnal events I chase - such as the aurora or noctilucent clouds - the lunar eclipse is perfectly predictable. We know precisely when and where it will occur. And so it was, with months to go, that the anticipation and preparations began. I and my fellow astrophotography buddy, Johnny Baird, had decided we were determined to capture this amazing scene, as the Moon would rise over the horizon already in its blood red totality. Such was its predictability that we were able to choose our ideal location (the lighthouse at Donaghadee) and even hire out super zoom lenses each so we could capture the eclipse in all its blood soaked detail. Everything was in place. Apart from one final element - the weather. June and July in Northern Ireland has been surprisingly good. Week after glorious week of sun-baked weather and crystal clear skies. Even the very week of the eclipse was like that. 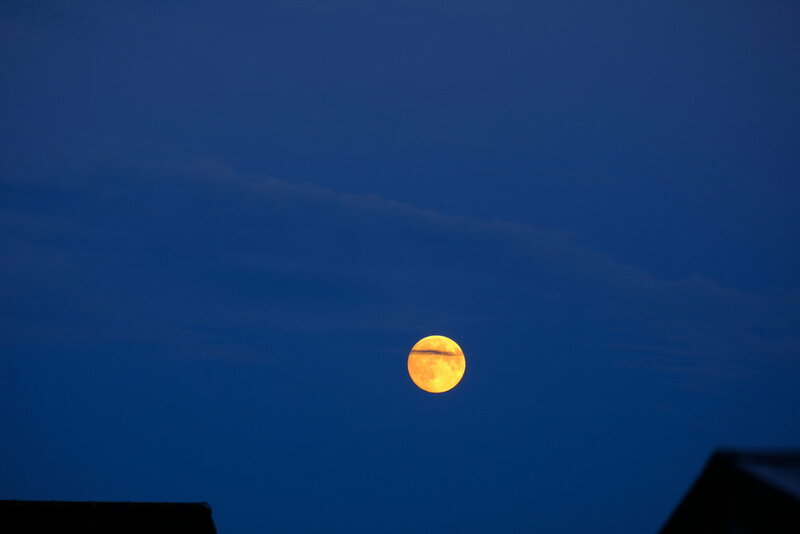 I saw the Moon rise each night up to the Friday, watching it get closer and closer to being full as the week progressed. The sight was so sweet. But oh so bitter sweet too. As we knew, all week, that the forecast was for the good weather to break down on the Friday with a return visit of an intense Atlantic depression, complete with fronts, rain and cloud - lots of it. Earlier in the week, all we could hope for was that the timing of the arrival of the depression was slightly out, and that it would be fashionably enough late for the celestial event to allow us a glimpse of the action. But, as the week, progressed, if anything the forecast firmed up more, and it looked like our chances were slim. Just like the final of Bullseye, we had decided to gamble, to head out. The okey was beckoning at Donaghadee. All we needed was 101 or more in 6 darts. We stepped our way across the rocky foreshore, getting into position on the okey. Could Jammy Hammy and Jammy Johnny and I manage just that smidgen of luck between us? And so Friday arrived - as did the cloud. It had built overnight and the whole of Ireland was not under the blanket. There were, however, tantilising gaps.The cloud was thinner that I had expected. Patches of blue skies were breaking through. And the Sun, although still behind the cloud, was shining through enough to allow faint shadows to appear on the ground. Johnny and I exchanged message throughout the day, vacillating between hope and despair as we anticipated the evening’s events. On my way down to the Dee, I stopped in at the BBC in Belfast. I had had a call earlier in the day asking if I’d like to be interviewed on the Radio that evening about the eclipse. I didn’t need asking twice, and so it was with a buzz of excitement and nerves that I was ushered in to the Green Room (which was a rather disappointing light beige colour) met up with my friend and all round decent bloke, Geoff Maskell, so see my 2015 eclipse images that he was planning on showing on the TV that night. Then, my moment was up, and in I was brought to the broadcasting room and sat down opposite Mark Davenport. He was in mid flow, and all he could do was glance up with a smile and give me a thumbs up. A few moments later, and I was live, broadcasting to the nation! Before I knew it, we were done, and out I was escorted again. 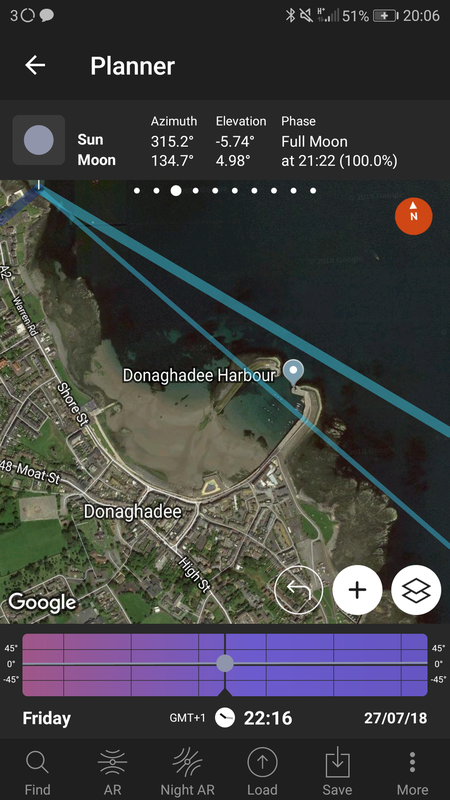 Time to rejoin the main goal of the evening and head to Donaghadee. After a good feed at a seaside chippy, we headed to the shore and got into place. Despite the cloud, our spirits were high. We weren’t expecting much, but the comradery was good and the banter flew as Johnny took our his hired 600mm prime zoom lens - something that was so big that I fully expected he would need a couple of pack ponies to transport it over the rocks! We got the lenses set up, the focus and shutter speed just right. We marvelled at just how much detail we could see in the lighthouse with our zooms. And we waited. 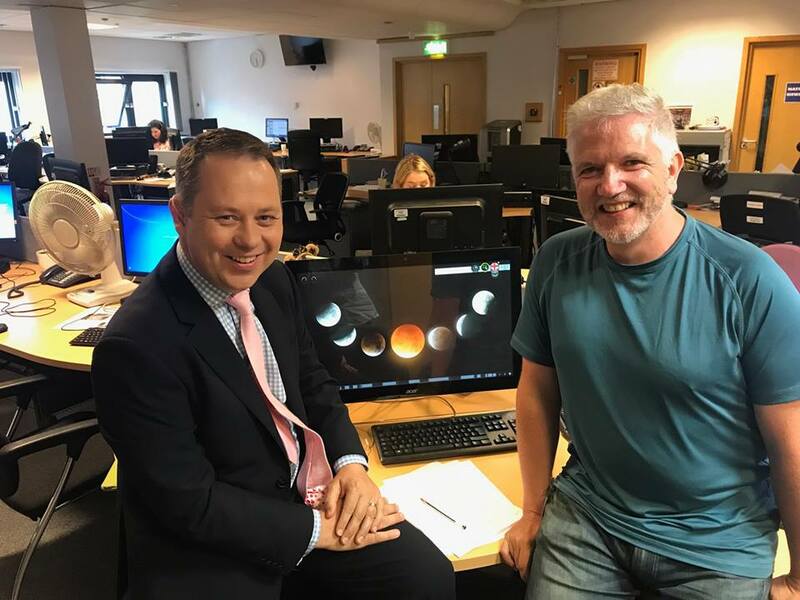 As the time for the eclipse got closer, we went live on Facebook, joining with the other astrophotographer all across Ireland who were being equally frustrated at the cloud. Towards the horizon, there was definitely cloud. But it looked thin, like that kind of cloud that the Sun can just about manage to poke through at sunsets. Could the eclipsed blood moon match that? Might we just be able to pull it out of the bag at the last minute? And then, 9.27 arrived. Moonrise time. Well, nothing but cloud. It wasn’t going to work out. All the knowledge and preparation in the world amount to nothing if the clouds are in a cantankerous mood. We stayed on for a while, of course. Just in case. Just in case what? I’m not sure. But we just hung around a bit more, just to be sure. By 10.15, when totality was all but over, we called it. We had gambled in the Bullseye final. And had missed the dart board entirely. On the way back to the car, our conversation turned to the next chance for a total lunar eclipse in Northern Ireland, thankfully only a few months away at the end of January, as we tried to keep our spirits high in the face of the disappointment. For that, I had to wait, not till January, but merely the next night. After a day of torrential rain over Ireland, the depression had done its worst, and cleared off for a bit of fun with the Mainland. The skies cleared as we headed into darkness. And there it was. 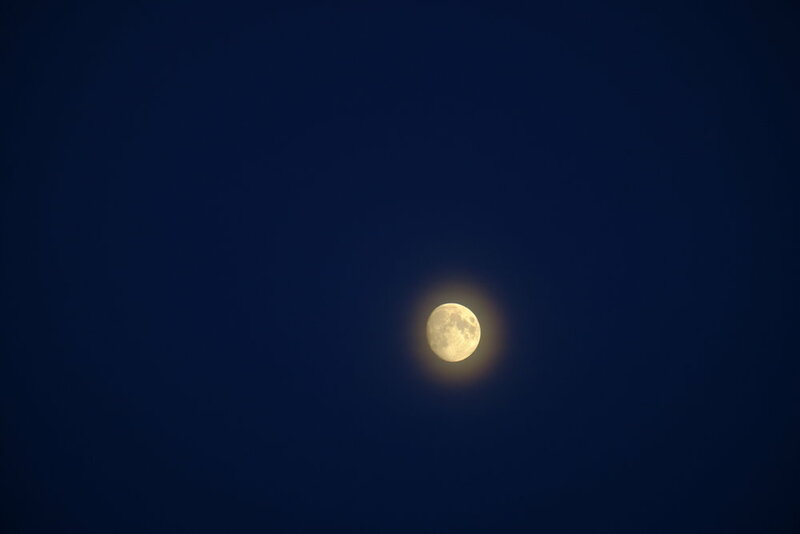 The Moon; in all its glory mere 24 hours too late. Here indeed is what we could have won. It was not to be this time. But the next exciting episode in our Bullseye lunar eclipse chase in just into the new year. We will be back. After all, you can’t beat a bit of lunar Bully now, can you? So, I couldn't resist using one of my eclipse images from 2015 to properly show what we could have won! Totally fake image - but totally achievable image, if the cloud had cleared off!